11/26/15 We will be out of stock for the next few days. For more information please see our new website. 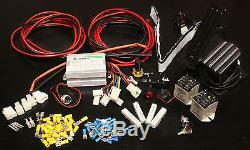 Power Wheels 24 Volt ESC Upgrade Kit. Also Works With Kid Trax, Peg Perego, Avigo, And More! The 24 volt upgrade done right. If you want to upgrade to 24 volts, an ESC is the safest and most reliable way to get it done. Simply adding another 12v battery to a 12v ride-on is dangerous and will. Damage the car over time. This kit includes parts which will allow the car to have a variable throttle which will allow for smoother and safer riding at 24 volts. Compatible with any 12v ride-on car. Does require some soldering and typically takes 4-6 hours to install. MORE DRIVER CONTROL SMOOTHER OPERATION TOP SPEED GOVERNOR. Keyed Ignition Variable Throttle Separate Brake Pedal Easy Accessory Add-ons (Lights, etc) Under-Voltage Protection (saves your batteries). WHAT IS AN ESC SYSTEM? An ESC system replaces the factory wiring in your 12v kids ride-on with 24v motor controller and supporting. That will allow gradual rev-up, faster speeds and a. Change the cars operation for the better and allows for a more capable but also more controllable machine. THE BENEFITS OF THIS SYSTEM. The most common reason to install this system is the ability to run higher voltage without destroying parts. If you attempt to install 24 volts in a stock system the motors will most likely overheat and melt and the gear boxes will be destroyed (ask me how I know this). It may be fun for a while (it was), but the fun will not last. With an ESC system, the gradual/smoother acceleration will lead to a longer gearbox life and also typically allow the use of factory 12v motors at 24 volts. Instead of the stock on/off throttle and automatic braking when the rider lifts off the accelerator, the ESC system allows the car to rev up or down smoothly and coast which is easier on the gearboxes and smooths out the ride. The system also reuses the stock gas pedal as a brake pedal and separating these controls allows for more advanced driver techniques and more fun! (Drifting, cruising, racing, power sliding, etc). WHAT IS INCLUDED IN THE KIT? 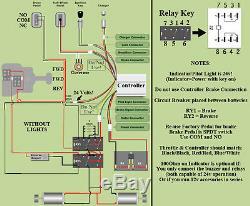 (2) DPDT Relays (For Reverse and Brake). Please specify preference during checkout in notes field. Charge Port (3 Prong Male Port, Requires 3 Prong Female Charger). That shows the versatility of an ESC system. (Warning: 37 Min Long, shorter version coming soon). Post Install/Troubleshooting/Parking Brake/Step Down and Power Block. 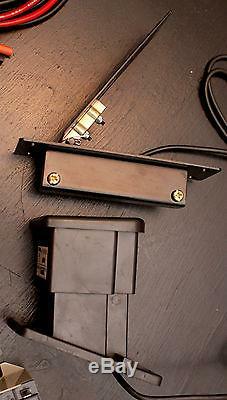 These parts allow for a very easy and clean way to install 12v accessories. 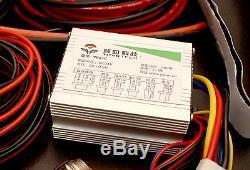 And is a great way to solve the 24v vs 12v problem for these installs. The step down converts the 24v indicator power (power source after key-on used for accessories). Then the power block makes distributing that power easy. The power block is unique in that it is already internally connected which makes accessory hook up a breeze. For more info (start at 6:20). Please note that these parts are optional since the relays and buzzer in the kit can handle to up 24v when used with the included 100-Ohm resistor. The kit includes a circuit breaker, brake relay, speed governor, back-up indicator and a proven controller. If this setup was not safe we (the modding community) would NOT install and use them with our kids!! In many ways this system is safer than the factory setup. Specifically the controllable variable throttle instead of the neck-jerking factory on/off throttle, the audible back-up indicator which reminds which drive mode is active and the speed governor which controls the top end speed. You will need (2) 12 volt batteries 12ah is the most common capacity. Re-using the factory PW batteries is not recommended since they have an internal fuse. The kit contains quality parts that have been proven to work, and work. Many have installed these parts and proven that they will work together reliably in your ride. Although I strongly recommend reading and/or posting on the modified power wheels forum feel free to send questions at any time. I provide my direct contact. To all buyers for install help. If you get stuck, do not panic! I recommend posting on the forum or you can contact me at any time night or day. To date I have a 100% install success rate. Tough and work the same but the angles of operation and mounting bases are. The plastic pedal mounts flush to the floor and has a straight travel and the metal pedal mounts partially below the floor and requires more cutting. For more pedal information please see this video. I 100% guarantee that this kit will meet your expectations. I stand behind the kit as a whole as well as individual parts 100% and if you experience any issues please contact me I resolve all issues quickly please note that you will not receive this level of. (Q) Can I use this kit with a brand other than Power Wheels? 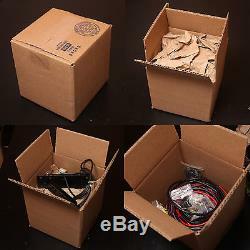 The kit could be installed on a cardboard box if it had 12v motors. You can install the kit on any ride on that was 12 volts from the factory since doubling the voltage on brushed motors is typically OK. If the car has 12v. It is possible to even install the kit on a 6v ride on but you must use the included governor to limit the top end since 24v will burn up 6v motors. (Q)Are instructions included with the kit? 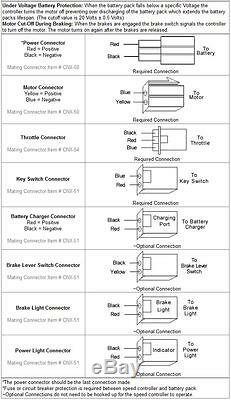 Installation varies based on the car but basically you remove most if not all of the factory wiring, place the ESC components as close together as possible in the car where they fit and make the appropriate connections as per the diagram. Installation time varies based on installer experience but typically takes 3-6 hours. If you are confused at any point, do not panic. You are welcome to contact me for help but I strongly recommend searching and reading on the Modified Power Wheels forums. And/or start a new thread on the forum when appropriate. If you look at the entire diagram for the first time it probably will be overwhelming. Break it down and take it one connection at a time. (Q) Can I use a single 12v battery instead of 24v with the kit? The controller has under-voltage protection built in (which will save your batteries if the key is left on) so the controller will not even power up if the battery source is below 20v. If you are concerned about too much speed you can use the included speed governor to reduce the top end speed with a twist of the dial. (Q) What do I use as the brake pedal? (A) Typically the factory pedal is reused as the brake pedal (which is typically a SPDT switch) but any switch can be used to trigger the brake relay such as a momentary switch/button on the steering wheel for ride ons with tight floor space. (Q) Do I need to upgrade the stock motors/gearboxes? (A) Over-volting the factory brushed 12v motors to 24v is possible and often fine over time but longevity ultimately depends on motor airflow, duration of constant use, rider weight, terrain type, etc. It is possible to do this but whenever possible upgrading the motors is recommended for reliability. Personally I upgrade to Banebot 18v 775 motors. Which are powerful and durable motors. The larger 775 motors require shims (for the older #7 gearboxes) and new hardware (35mm M4 bolts) to work with the factory gearboxes but there are many options for new motors. I recommend looking at HPI 550s (especially for more speed), Titan 550 or 775, etc etc. (Q) Why does the schematic not use the brake connection/function on the controller? (A) In the past there have been controller failures when the controller brake function was used. Although this occurred with a different model motor controller than what is included in the kit, it is now common practice to use a relay to control braking and completely avoid the controller braking function which in the end allows fine tuning of the brake softening and brake reliability. Upgrading older #7 gearboxes (with white gears) to newer #7R gearboxes with orange gears. Some very new 7Rs have white gears. Is recommended but not necessary. For more motor and gearbox information please see this video. (Q) Is the kit difficult to install? Although the diagram is sometimes overwhelming to new modders it is. Just break it down and make one connection at a time. If you get stuck at any point or are confused feel free to contact me and I will help you through the process. I try to make myself available as much as possible to help guys through the. To do a clean and reliable install the process will take some time but it is not difficult to complete and once you understand the system you can customize it to make it your own and the process is often enjoyable for most that take it on. If you have any questions, comments or concerns please feel free to contact me at anytime. The item "Modified Power Wheels 24v ESC Conversion Kit Upgrade To 24 Volts +Speed +Power" is in sale since Wednesday, May 06, 2015. This item is in the category "Toys & Hobbies\Electronic, Battery & Wind-Up\Battery Operated\1990-Now\Ride On Toys & Accessories". 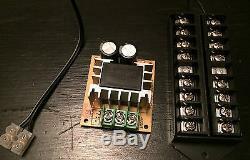 The seller is "eastcoast_powerup" and is located in Southampton, New York. This item can be shipped to United States, to Canada, to United Kingdom.